Central Plaza is a 49,100 sq. 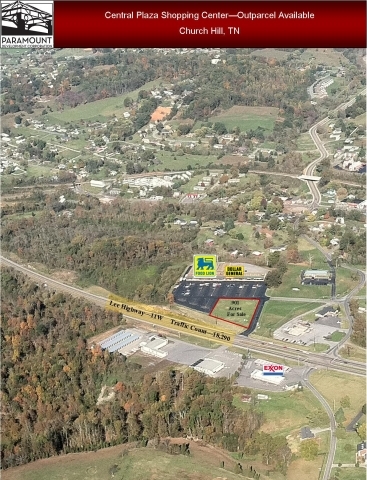 ft. development anchored by a Food Lion in Church Hill, TN (Hawkins County) and is located on Lee Highway (US Highway 11W). The Church Hill market is part of the Kingsport – Bristol (TN) – Bristol (VA) Metropolitan area, which is commonly known as the “Tri-Cities” region. A 0.901 acre outparcel is available for sale. The site is ideal for retail, office or medical.